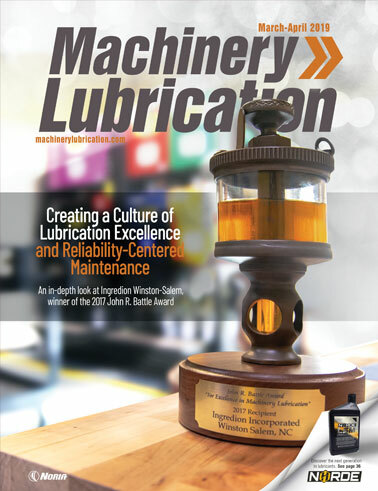 Machinery Lubrication recently asked readers to participate in its annual Lube Room Challenge by submitting exceptional lube rooms that incorporate best-​practice features. 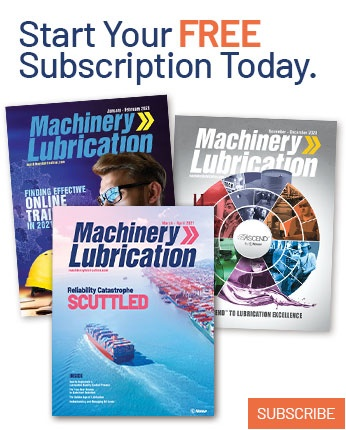 Several readers met the challenge with evidence of how their lubricant storage and dispensing methods have been transformed. 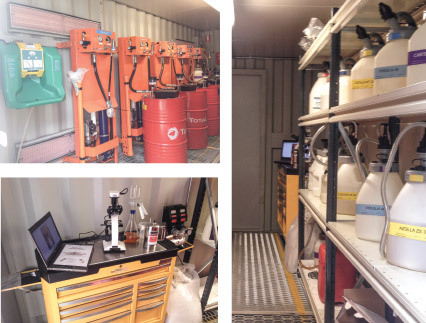 The following entries showcase how designing a proper lube room not only is an important step in the journey toward lubrication excellence but can also increase a company’s bottom line. seven different areas across the manufacturing floor. loading dock and waste oil collection. The Aleris rolling mill in Clayton, New Jersey, supplies foil and light-gauge aluminum coiled sheet. For its lubricant storage, the mill had been utilizing seven different areas across the manufacturing floor. The plant also had just one filtration unit for all its oils, and this unit was seldom used or maintained. Drum pumps and makeshift hoses and fittings were employed to transfer oil to open, unlabeled containers. The drum pumps were not segregated, so nothing prevented them from being used in different oils. There was also no filtration of the oil during the transfer process, including when bulk hydraulic oil was transferred from tanker trucks into reusable totes. After reviewing previous equipment failures and gearbox inspection reports, the mill made several modifications. Additive packages on some oils were changed. A color-coding system was developed and employed throughout the facility. 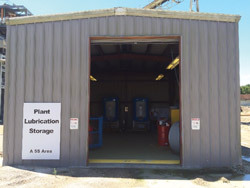 The lubricant storage area was consolidated into one climate-controlled location away from the manufacturing floor and equipped with a loading dock and waste oil collection. Now, drum and platform filter carts are utilized, and single-station filter and dispensing areas have been installed. There are dedicated transfer hoses and oil containers, as well as filtering of transferred oil. Bulk hydraulic oil transfers are made from tanker trucks through filters into storage tanks and then from the bulk storage through filters into filter carts. The filter carts are used for topping off reservoirs. to edit its corporate standards manual. 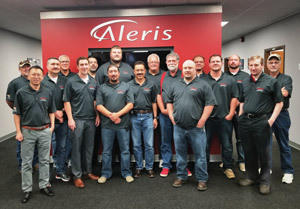 Aleris also launched a corporate reliability program, which began with an evaluation of all company plants. This evaluation consisted of everything from work management and lubrication to contractor management. Every plant was graded on a scale of 1-5 in 11 different areas. Of these areas, lubrication, work management and training were chosen to be the focus of the plants’ initial efforts. The emphasis on lubrication led to the formation of a lubrication technical advisory group (TAG). This group was comprised of representatives from each of the plants and tasked with creating a general lubrication corporate technical manual. Monthly calls were scheduled to discuss the project and to assign areas of responsibility. Noria consultants were also brought in to help finish the manual, which has become a complete training guide for the development of best practices in lubricant storage, preventive maintenance and leak management. This new manual will be essential for Aleris as it establishes a lubrication audit program and minimum requirements for all of its plants. is now filtered before entering a machine. Just a few years ago, the Bunge plant in Lehliu, Romania, had no lubrication room or filtering area for lubricants. Grease was dispensed by hand and easily contaminated. After the company determined changes were needed, a lube room was built inside a mechanical workshop building. 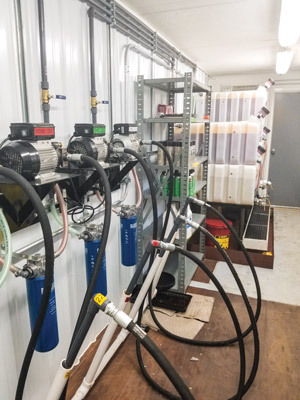 The new room features four grease-​dispensing units and eight oil filters, with the goal of using each filter for only one type of oil. Although only five of the oil filters and two of the grease-dispensing units are currently in use, the plant has made significant progress. Today, each type of oil is filtered, and grease is no longer contaminated. All transfer containers, grease guns and storage units are also clearly labeled. The Bunge facility continues to see improvements in the performance of its lubricants and is now strictly following new procedures for lubricant storage and handling. City Utilities (CU) is a municipally owned utility serving Springfield, Missouri. CU owns and operates two coal-fired generation units as well as a number of gas turbines and a landfill gas-to-energy project. In 2015, a lubrication management survey revealed many areas for improvement throughout the power generation facilities, including lubricant chemistry, cleanliness, testing, and lubricant storage and handling. A system of separate dispensing tanks had been in service for some time. However, the tanks were open to the atmosphere, had no filtration capability, and utilized a single pump system and combined piping for filling and dispensing all stored lubricants. In addition, the tank system was located in an open area of the station adjacent to an open delivery and maintenance bay, which was exposed to dust and other pollutants associated with the coal-fired power plant. In 2017, a storage and handling system was placed into service. A new state-of-the-art dispensing system is now located in a closed room away from the dust and heat of the plant. The new dispensing system features separate pumps, filters and piping for each lubricant, and every tank utilizes desiccant breathers for ventilation. Dispensing jugs used for transferring smaller quantities of fluid are also stored inside closed cabinets in the new lube room, as opposed to open shelving. For larger quantities, transfer pumps with filters specifically matched to the application are now used. To minimize the chances of cross-contamination, lubricant tanks and jugs are coded with a color and shape which correspond to coded tags on the lube points of various machines. Bulk lubricant storage has been another area of significant improvement. Oil barrels previously were stored both inside and outside in a very disorganized manner. The lubrication management survey also revealed many consolidation opportunities. Through consolidation and organization, the lubricant inventory has been reduced from more than 100 barrels to nearly 30. Furthermore, every new barrel of oil is sampled prior to entering the inventory. 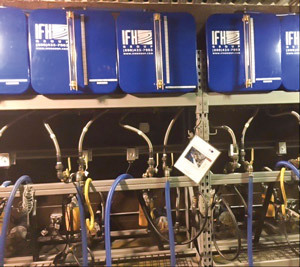 Other lubrication program improvements that have been or are being implemented include regular sampling of machinery, sealing up lubrication systems, improving in-line filtration, installing desiccant breathers and adding quick disconnects to facilitate clean oil transfers and lubricant filtering. The organization currently has three technicians who are trained and certified as a Level I Machine Lubricant Analyst, with more to receive training in the future. When the utility first began implementing these changes, the overall state of in-service lubricants showed only 60 percent at a severity of 0 or 1 (good/acceptable) and 24 percent with a severity of 3 or 4 (bad/unacceptable). Today, 90 percent have a severity of 0 or 1, and only 3 percent remain at a severity of 3, with none in the severity 4 range. Although there is still quite a bit of work remaining to achieve world-class status, the improvements that have been made are paying off in greater equipment reliability and economic benefits. the need for partial drums. The International Paper mill in Port Wentworth, Georgia, manufactures specialty grades of pulp that can be found in products around the world. In 2011, the mill formed a reliability team to help eliminate lubricant contamination and improve overall equipment reliability, product safety and quality. One of the team’s primary focuses was on lubricant storage and distribution. The mill had many remote lube areas, and contamination control was minimal. Lubricant labeling was either missing or not standardized. Oil also was not filtered from the drums. The reliability team developed standard operating procedures for labeling transfer containers and purchased filtration carts. A 5-S room was created for consumables such as sight glasses, breathers and filters. Battery-operated grease guns with gram counters were procured, and all the site’s grease guns were calibrated. The team also worked with its lubricant supplier to consolidate its lubricants. 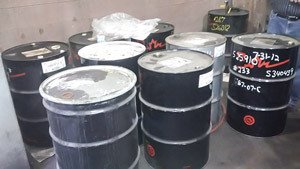 Samples are now taken from incoming oil drums. For storing grease, shelving with clear labeling was installed, and the first-in, first-out (FIFO) method employed. In 2016, a centralized distribution system was implemented. The lube room, which came as a packaged unit, is climate-controlled and sealed to prevent contamination. 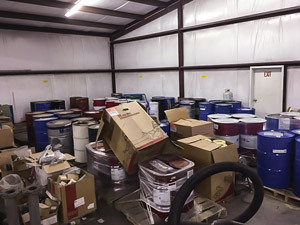 The facility’s most common oils are pre-filtered and stored in stackable totes. This has greatly reduced the inventory of full drums and the need for partial drums. 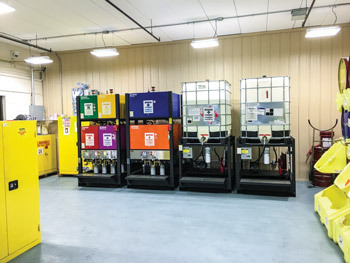 The mill’s future plans include purchasing color-coded transfer carts and staging them in the lube room. Installing hose reels and quick connects will allow these carts to be easily moved and avoid having to carry jugs of oil up and down stairs. and a patch kit workstation. Located on the South Pacific Island of New Caledonia, the Koniambo Nickel industrial complex is one of the world’s largest nickel producers, including a mine, smelter and power station. 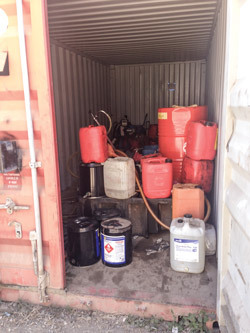 Storage and dispensing of lubricants previously were carried out from a cluttered 20-foot container situated next to the power station. With oil funnels and drum pumps open to the environment, high levels of contamination were introduced into new oils prior to their use in equipment. It was clear the site needed new equipment and a culture change regarding its lubrication practices. 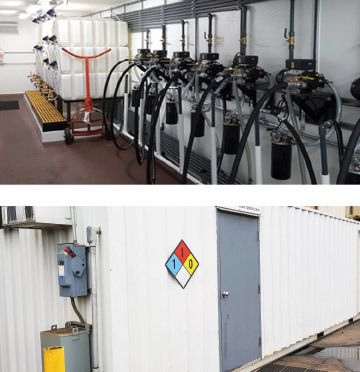 After Koniambo Nickel reviewed various types of lube rooms, it determined that the “plug-and-play” units provided many advantages, such as avoiding the cost of building a dedicated facility while offering the convenience of receiving a unit that was fully set up. Due to the mine’s location, an insulated ceiling and secondary skillion roof were fitted to the container to reduce the internal temperature. 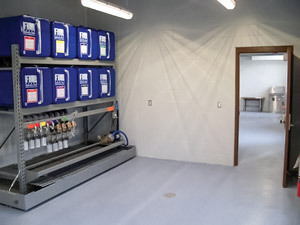 The 20-foot lube room was then custom designed and equipped with fire extinguishers, an eyewash station, bunded flooring, intrinsic lighting and power, and air-operated pumps for the storage and handling of flammable and combustible liquids. Side air vents with air filter pads help to reduce dust. The room is also kept closed for dust suppression. Racks were installed for dispensing containers and 20-liter drums. A color-coding system is employed for the dispensing stands and containers. The dispensing stands also feature filtration, taps and quick-connect options. A patch kit workstation is utilized to monitor oil cleanliness and assist with activities such as the use of filter trolleys. Now that its lubricant storage and handling practices are in order, the site has turned its focus to improving lubrication management, including installing sight glasses and upgrading its breathers and sample valves. Lakeside oil room was dirty and unorganized. The Lakeside Foods plant in Owatonna, Minnesota, produces canned vegetables for the retail and food-service sectors. To determine the proper lubricants for its equipment, the facility worked with a local oil specialist to conduct a complete plant survey. Following the survey, the site was able to consolidate many of its products and transition to 100 percent food-grade lubricants. All equipment was also individually tagged to indicate which fluid is required. By switching from drums to bulk tanks, plant personnel now have an immediate visual indication of when oil is running low and no longer must guess how much oil is left in drums. This also has eliminated the need to store empty oil barrels and provided a much neater appearance. In addition, the facility was able to switch from five different oil vendors to one. In doing so, annual oil expenses at the plant have been reduced by 32 percent. Purchasing has also been streamlined, freeing the maintenance supervisor to spend more time on equipment maintenance. stayed full of rain water. the new lube storage area. marking the designated areas for storage. The journey to world-class lubricant storage for the Mosaic Four Corners phosphate mine in central Florida began in 2015. A companywide “awakening” to the need for better lubrication practices had occurred a few months earlier. The mine’s first focus was on creating a lubricant storage area from which subsequent lubrication improvements could take root. Bulk oil totes had been scattered throughout the plant and stored outside in the muddy and humid environment. Because the bulk totes were stored outside, the mine’s portable oil containers were also filled outside and kept in work carts overnight. A storage shed was identified as an excellent location for the new lube storage area. The shed was cleaned out, the floor sealed and a berm constructed so oil would not permeate or escape the shed in the event of a spill. Small repairs to the shed also had to be made to prevent dirt and rain from entering. The new lube storage area is a shared space between three maintenance crews (a total of 35 mechanics). A daily 5-S walkthrough is performed as well as a monthly audit. Safety is a critical concern at Mosaic, and the lubrication area is no exception. A binder containing all lubricant material safety data sheet (MSDS) information is kept on a shelf in the area. The berm around the inside of the space was painted yellow to prevent trips and falls. Fire extinguishers are placed in accessible areas. The space also includes proper signage, a portable eyewash bottle and a rolling ladder for accessing the top of bulk oil totes. 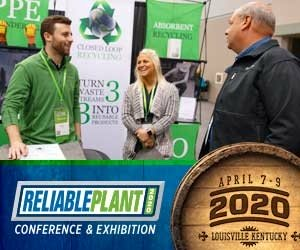 In addition, industry best practices are now followed, such as the use of a color-coded lubricant identification system, filters and desiccant breathers for every drum and tote, and new portable oil containers, which are filled by a filter-through quick connect. The lubricant stock has also been reduced and relocated to the area so extra totes are not stored outside. Without management support, the new lubrication area would not have been possible. The total cost of the project was nearly $43,000, with most of the expenses related to sealing the floor, installing the berm and replacing the overhead door. The results have been remarkable. The 5-S score from the monthly audit has averaged 98 percent. All oil going into the lubrication area is now quarantined until it is filtered. This has increased oil cleanliness for the bulk storage containers. The world-class lubrication area continues to be a positive influence on the mine’s improvement efforts, providing a sustainable resource for mechanics where lubrication-related items are easily accessible. The Mueller Co. plant in Albertville, Alabama, is an iron foundry and fire-hydrant manufacturing facility. The site had been storing lube oils alongside paint and thinner materials in a building where the roll-up doors were always open. This resulted in the oils being exposed to dust, high humidity, high summer temperatures and below-freezing winter temperatures. To help correct this issue, a portable lube room was purchased and installed. The plant now is able to pump oils into labeled storage totes via low-micron filtration, with each oil having its own labeled pump. All oils are filtered out of the drums and into these totes. The environment is temperature-controlled at 70 degrees year-round. A dehumidifier and proper oil transfer containers are also employed. Additionally, the lube room is locked to everyone except the lubrication specialists and their supervisors. In 2017, these efforts have saved the plant more than $38,000 in oil costs alone, which for a small facility is a big deal. was old and needed to be updated. at the Michigan City plant. Located on the shores of Lake Michigan, the Michigan City and Bailly generating stations are coal-fired power plants which are owned and operated by the Northern Indiana Public Service Co. (NIPSCO). Both facilities had been using older lube rooms and needed to update their lubricant storage and dispensing systems. A single transfer pump was being utilized to remove oil from drums, and filtration of new oil also was not standardized. NIPSCO sought reliability improvements. The company worked with its lubricant distributor to improve its lubricant storage and handling practices. Maintenance personnel learned that proper lubricant handling can be a critical step in equipment reliability. The new oil storage rooms employ individual pumping systems to eliminate cross-contamination of lubricants. Inline filtration and desiccant breathers help to ensure oil cleanliness. Oil and grease inventories were consolidated, and wall charts have been updated to clearly display equipment and product names. 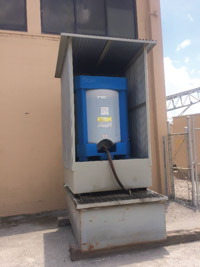 A safety cabinet was also purchased to store sealed lubricant transfer containers, which are dedicated by product and used for handling smaller oil quantities. While work continues on labeling equipment fills with the correct lubricant nametags, considerable progress at both facilities has been made with excellent results. Just a year ago, the Owens Corning composites plant in Aiken, South Carolina, realized its lubricant storage and handling practices had become a problem. This resulted in the site’s lube room being cleaned and painted. Better lighting was installed, as well as heating, ventilation and air conditioning (HVAC). Oils and equipment were tagged to prevent misapplication of lubricants. Policies and procedures were developed for the lube room along with safety and emergency instructions. The room is now explosion-proof with its own fire-​suppression system. An automated system notifies the staff when oil sampling is needed. Each week, personnel are also required to clean the lube room, inspect for leaks, filter the oil in storage and restock the inventory. Of course, the upgraded lube room only marks the beginning of the facility’s journey to excellence. The improvement process continues one machine at a time. The plant still has a long way to go, but the employees are learning a lot and have already seen measurable gains on the company’s bottom line. drums and oil rags scattered around the area. lube storage and dispensing system. The Sheboygan Regional Wastewater Treatment Facility in Sheboygan, Wisconsin, cleans the wastewater for more than 68,000 residents in seven local communities. 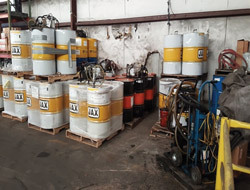 When a construction project reduced its oil storage room by 58 percent to only 315 square feet, the facility had to find a way to consolidate its lubricant inventory and locate a proper in-plant storage area. The site’s oil storage was also messy, with dirty drums and oil rags lying around, as well as leaking and outdated drum pumps. 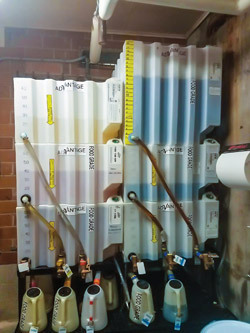 A new lube storage and dispensing system was purchased, which included color-coded labels, quick filter assemblies, spill containment and sight gauges for inventory control. By standardizing its oil type and getting rid of obsolete oil, the plant was also able to eliminate seven 50-gallon drums. The new lube room is now clean and well-lit. The walls have been painted, and an epoxy coating has been applied to the floor. 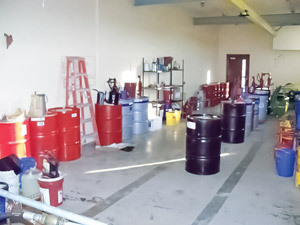 The facility not only was able to save valuable space, but its oil storage is now neat and organized. The result has been a cleaner and safer environment for the plant’s lubricants and employees. at the Wiegel Tool Works plant. Wiegel Tool Works (WTW) is a metal-stamping manufacturer in Wood Dale, Illinois. Established in 1941, the company specializes in complete turnkey packages, including engineering, prototypes, tool construction and wire/electrical discharge machining. Through the years, the company has invested heavily in new technology and equipment. 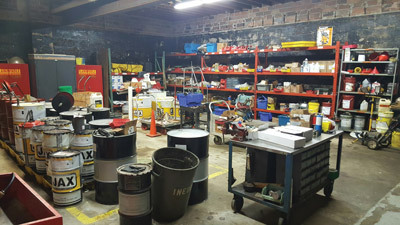 As part of its continuous improvement culture, management identified the oil room as the next key improvement opportunity. The original oil room did not meet best practices and was due for a redesign. Oil drums were stored on racks and the floor. No level gauges were used on drums, which resulted in poor inventory control. Each oil drum also did not have its own designated pump. This increased the risk of cross-contamination, as pumps were interchanged across drums. Proper identification of oils and oil containers was another major problem. At the beginning of the improvement project, WTW’s lubricants were examined, and the consumption rate and storage capacity were determined. An efficient and cost-​effective method of storing oils was employed, with the facility’s highest running oils stored in 300-gallon rack systems. The average running oils are stored in 120-gallon and 65-gallon bulk storage systems with color-coded tanks. These systems have dedicated pumps, filters and breathers for each oil. The plant’s low running oils are kept in 55-gallon drums and stored on a spill-containing rack system. This new layout offers a compact footprint, allowing more oil to be stored in less space. All oils now have a designated container, location, color and shape for easy identification. The oil containers also have color-coded lids. Having designated containers for each oil has helped to prevent cross-contamination. In addition, the entire oil room was completely remodeled. Floors were painted with industrial-grade paint to eliminate oil stains and provide for easy cleanup. Two new cabinets were purchased to store the oil containers, with each cabinet having color-coded locations for individual containers. The oil room project has been a major success. Since the room has been in place, WTW has received positive feedback from its staff and seen lube-​related mistakes decrease significantly. Employee attitudes toward the room have also changed. With its continuous improvement culture, WTW plans to pursue new ideas for creating an even more efficient oil room in the future.